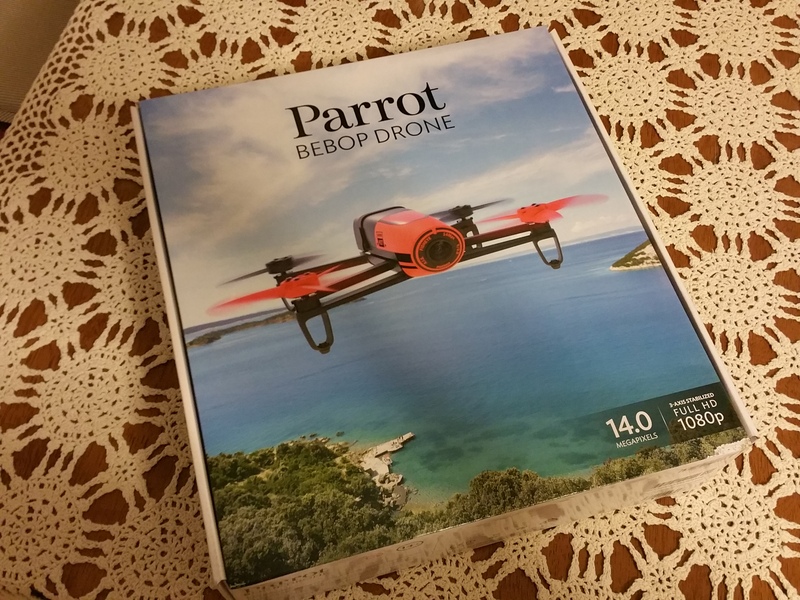 DroneFlyers.com purchased a Parrot BeBop from Best Buy…cost with tax was approx. $550. 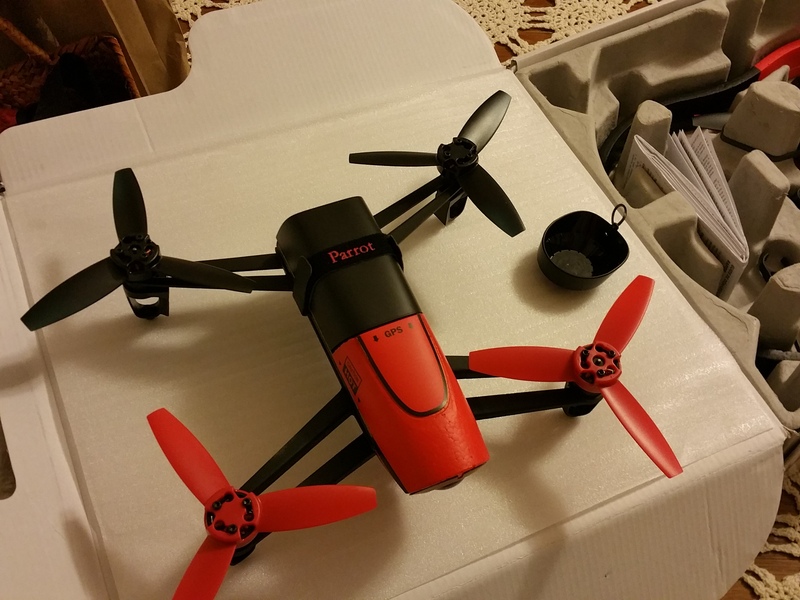 For that price you get more capabilities than with the earlier Parrot ARDrone 2.0. This is a GPS enabled, video steaming UAS that is controlled by your own Smart Phone or WiFi Tablet. Also note, DroneFlyers.com purchases every UAS we review, just like you would. We don’t want Manufacturers to send us a “pre-tested” model, we want exactly what you’d get from the store. By doing this we will give real results from field testing. We do not reprint Press Releases or copy what the manufacturer wants us to say about their bird. Parrot Bebop Drone (1), Batteries (x 2), Extra propellers (x 4), Propeller mounting tool (1). Charger (1), Charger Plug converters (x 4), Lens cap (1), USB / Micro USB cable (1), and the Hull protections (x 2). You also get a quick start guide, its a fold out multi language paper guide that only gives a minimum amount of information on the BeBop. It’s not enough information on what you need to do to fly – with no mention of where to get the full instructions on how to fly it either! 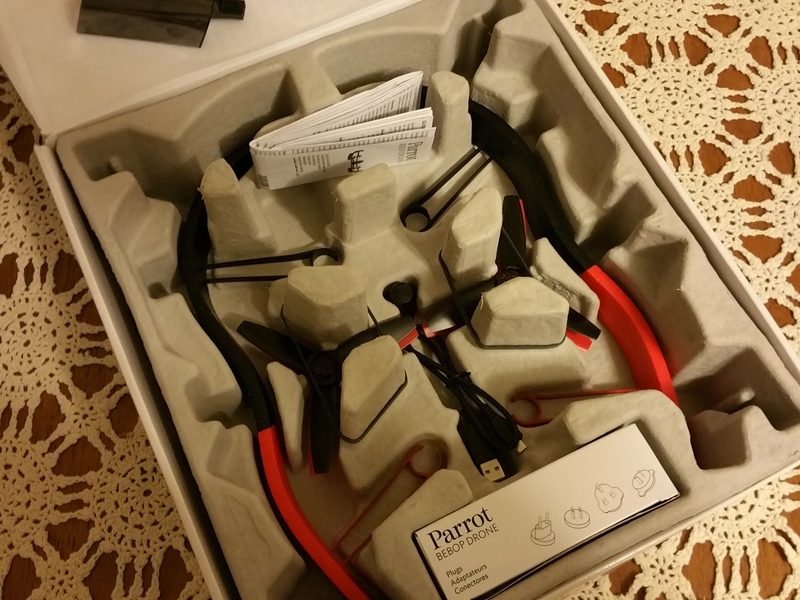 More about the lack of instructions later……Hopefully, Parrot is rethinking the quick start guide and will considering including more documentation in the box. 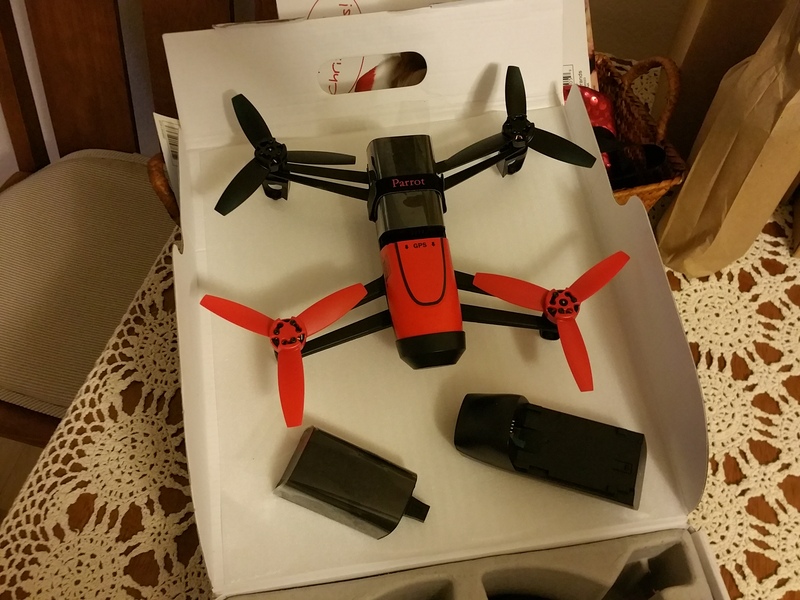 Two batteries are included and the extra propellers – this is a nice touch, as most new quadcopters come with only a single battery. The Box is well designed and can be used as a carrying box to and from the field. Everything has a place and is well protected by the egg crate type holder. The Hull Protections are clip on foam bumpers that are used for indoor flights to protect the BeBops propellers from hitting walls or furniture. 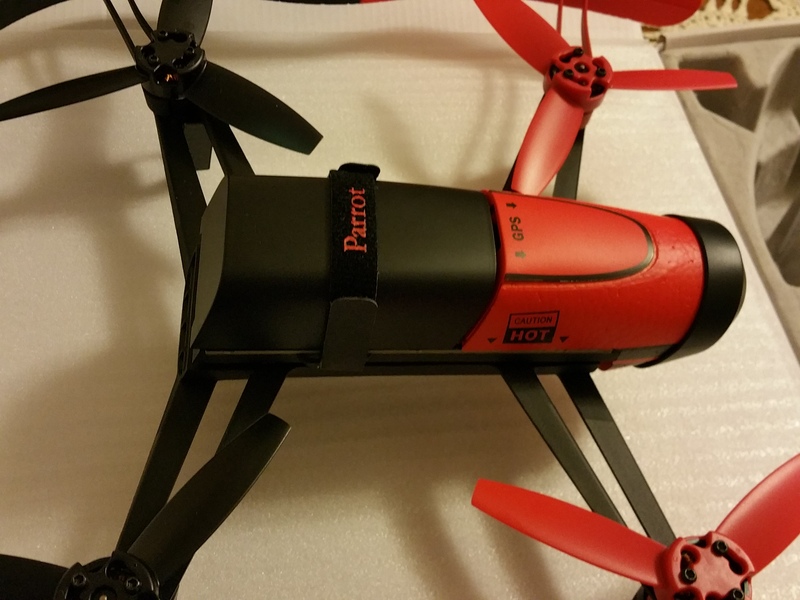 They are made of a denser foam than the ARDrone 2.0 and seem to be adequate for the job. Now, before you begin you are going to need to do a few things. 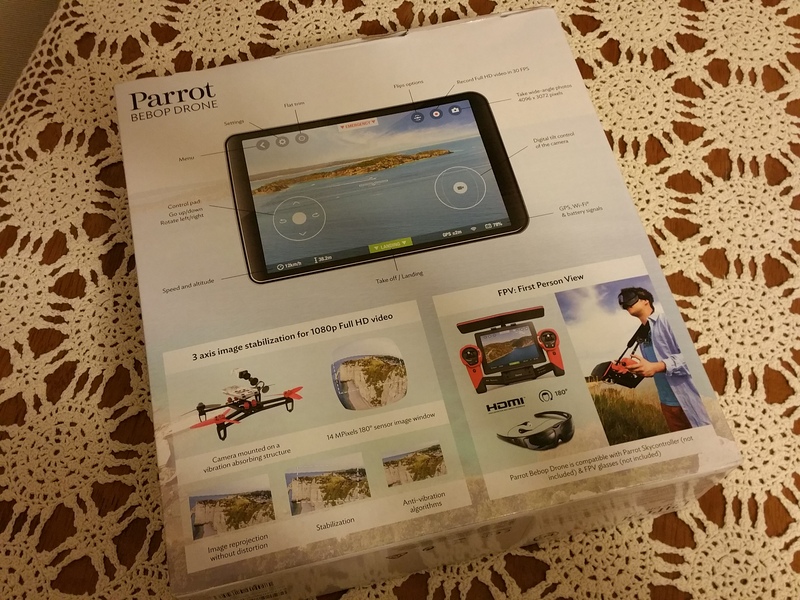 2, You will definitely need to download the user guide from http://www.parrot.com/usa/support/parrot-bebop-drone/ …….otherwise you will have no idea how to do anything else. This is a big concern with the useless “quick start guide”. 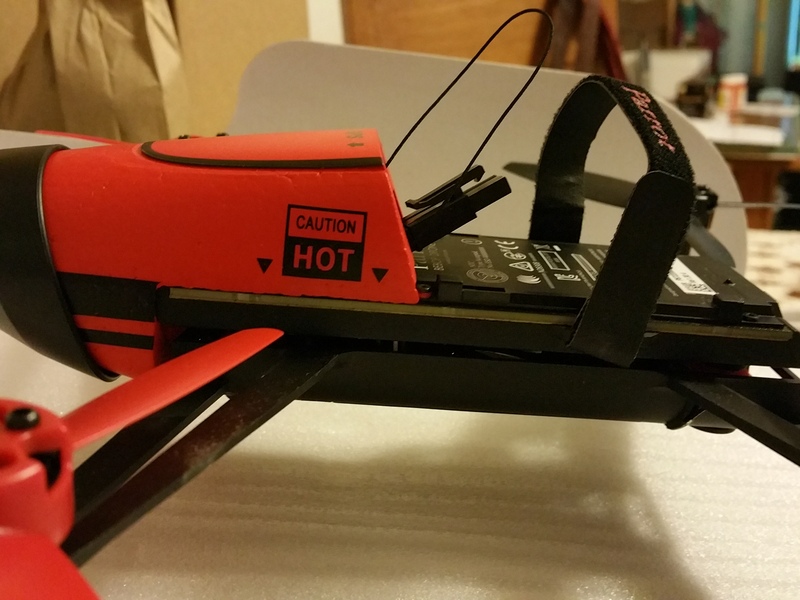 There is much more you need to know before flying the BeBop…if you don’t want it to fly away or crash! 3, Charge the batteries. You will need to install the correct charger plug converter onto the charger for your country. Then give each battery a full one hour charge. 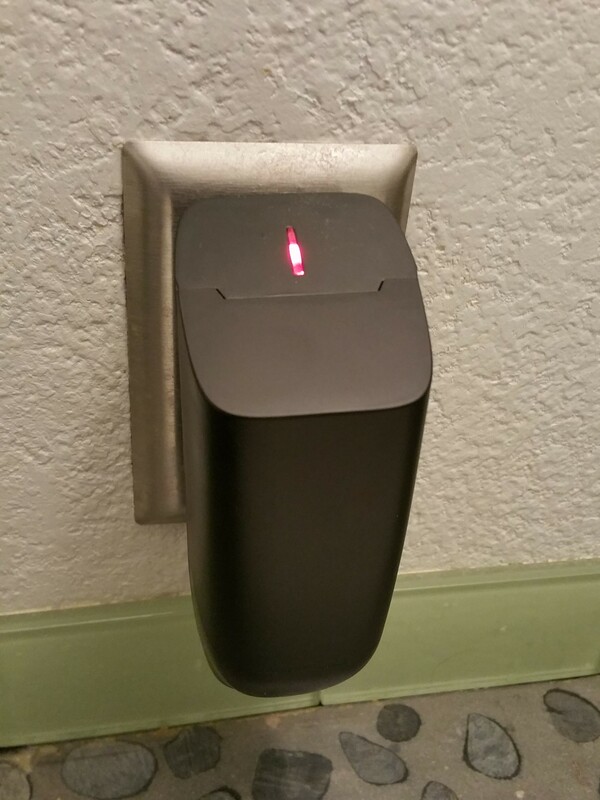 The LED is red when charging, and will turn green when charged. Note, on this first charge the LED will turn green before the hour is up, let it charge for the full hour before you fly or your first flight will only last a short time. 4. Installing the battery – yet another goofy thing that you would not know without the full instructions. 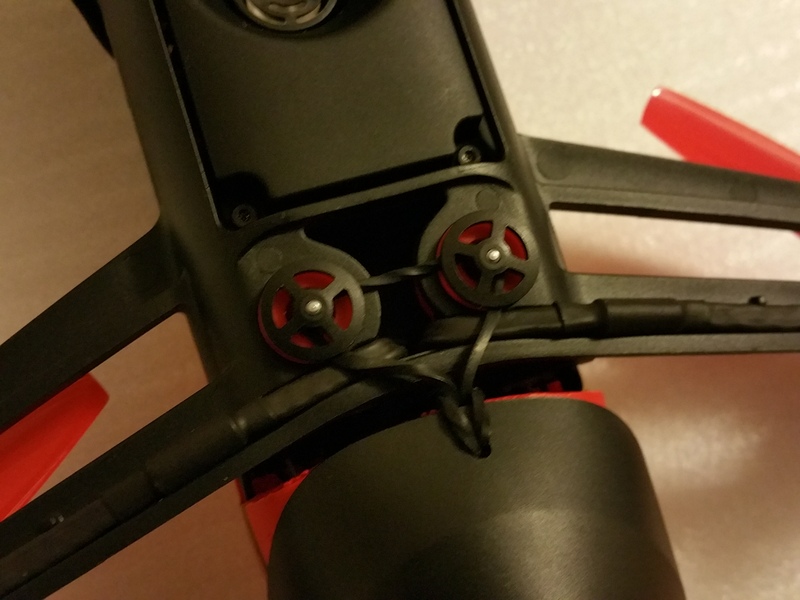 a. Plug the battery to the Parrot Bebop Drone’s power cable (A). If necessary, pull the string to access the power cable. b. Connect the power plug and slide the battery into its compartment. c. Attach the strap to hold the battery. 5, Connect the Bebop WiFi to your phone, tablet, or other compatible device. 6, Open the Free Flight app, and again something not covered in the Quick Start Guide…….enter the setup menu. You are going to have to do a few things before that first flight. The sensors on the BeBop need to knoiw what orientation they are in, one screen will have you rotate the BeBop on three axis to calibrate them. Then you have to pre-load the GPS maps to the device your flying with, this is done on another setup screen and is a safety concern of ours. You have to disconnect from the BeBops Wifi to connect to the interweb to download the maps for your location, but to do this you have to first be connected to the BeBop to get to that screen. So you have a BeBop sitting near you without any controller connected to it while you downloading the maps, this is a sure-fire way of having a UAV just decide to fly all by itself………. There are other options to set if you wish as well, one being how the device controls the BeBop. Default is by holding a finger on one pad and tilting the device in the direction you wish to go. Or by “joy-stick” where you have to push the onscreen pad in the direction you want it to go (and the way this reviewer prefers). You can also change maximum altitude, angle of attack, among other settings. All of this will be covered in parts 2 and 3 of this review as they are for the more advanced pilot. During setup you may find that the app tells you there is an update needed on the firmware of the BeBop, or even the app itself…..follow the instructions and do it if needed. Finally, after all this, you get to fly. but you may have noticed during setup you have no video……or do you. Remember in the contents there was listed a lens cap, well take that off too. Well what do you know, there is a built-in Camera with Video and Still capabilities! I have to say, I am impressed with how it fly’s. 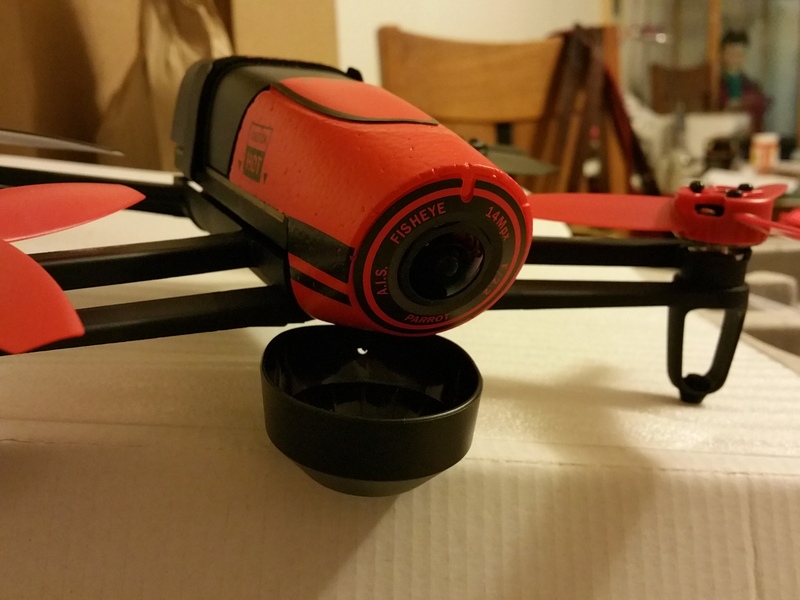 It is very stable and fast when you push it, noise while flying is mimimal. 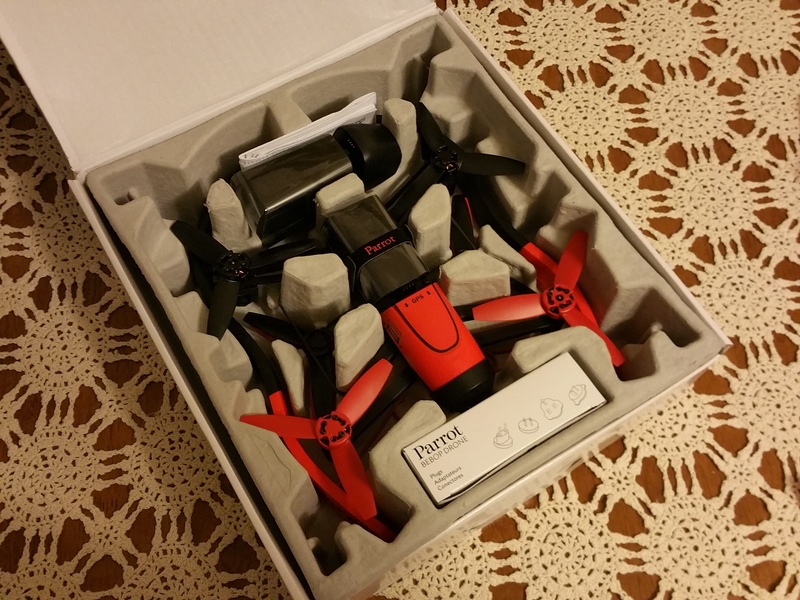 It is a fun machine to fly…..just like the ARDrone 2.0 was, even better in the performance areas. We have about 20 flights so far with very few problems other than what is mentioned below. It is a great toy, it has good video recording capability, and the picture quality is good. That is it, its a fun toy….an expensive one too. The BeBop is not a beginners toy, this is for someone who has a little flight time under their belt and understands the basics of UAS flying. The prospective owner better know how to pick up instructions and read them first, or they are going to have problems…..and likely lose their BeBop! 1). Video lag, it will not play at 30 fps streaming on / to the cell phone (Samsung Note 4) or the tablets (Apple iPad and Samsung Tab 3 8″). At best it was one or two frames per second, poor performance compared to the ARDrone 2.0. But the recorded video and stills look great (more on this in Part 2). Parrot needs to lower the video resolution that is sent to the hand held device, you really don’t need full HD for a camera view on your hand held device, as to there claim of being able to do FPV flight, not with this poor streaming performance. 2). Set up, the drone has to be on and connected to change the Free Flight 3 settings. This we find unsafe. If for some reason you accidentally hit “take off” your going to get hurt (the propellers are like little knifes rotating at tremendous speeds) or it will fly onto something you don’t want it too. Parrot should really address this and allow the control settings to be set without having the BeBop on and connected. 3). GPS / Location setting, you have to have the drone on to enter the setting screen to get to the section and then load the maps, but you have to go to WiFi settings on the device and disconnect from the BeBop so you can connect to the internet to download the maps and save them to the device….the reconnect to the BeBop to fly….and you have to do this every time you go to a new flying location. Out at the AMA field we had no internet connection (its way out in BFE) so I could not load the GPS maps for that area. So testing the GPS functions has not been done yet (flight plan “autonomous mode”). Again, Parrot needs to fix this. 4). Is it worth $500, maybe……..There are smaller UAS’s that have a small video camera for far less than $500, let alone $900 with the optional Sky Controller. However, at present, none of these offer stabilized video – for that you have to spend upwards of $900. Given the poor video streaming to a hand held device the “ability” of the Sky Controller as an FPV device is doubtful – consider the screen to be of use for “framing” your video or still pictures. The Bebop should be flown similarly to all LOS (line of sight) quadcopters – that is, by you looking at the machine itself and not the screen. ..we did test this in a safe way. First we tethered the BeBop to the ground with fishing line and a dog run stake. Then deleted the magnetometer calibrations, flat trim, and initial GPS map setup (reset to factory settings). Followed this by just flying it (like most people would do if they did not read the instructions first)…it tried to fly away as it had no idea where it was, had no idea what direction it was facing, and had no idea what flat and level was..so it tried to shoot up and fly as fast as it could in some random direction. The tether kept it safe and once it pulled it close to the ground the BeBop shut itself down and “landed” without any damage. 6). Range has been tested by walking it away from a hand held device (not flying it and hoping it would not flyaway). The Samsung’s got 150 meters before the signal was too weak, the Apple iPad only got 50 meters….less than advertised (but they do say “up to” 200 meters). Even at 50 meters it is really nothing more than a dot with no real way to tell its orientation, so following the “line of sight rule” the range is fine. We expect that most people are going to go beyond the line of sight “because they can” and then complain the BeBop just flew away and they lost it. Digging deeper into it I have found two external antennas, they are printed circuit board types and mounted on the two rear motor pods…….yep right next to the most electrically noisy areas of any UAS, the motors. 7). Safety, it has areas that get very hot, burning hot, and the instructions and decals on the BeBop tell you this. 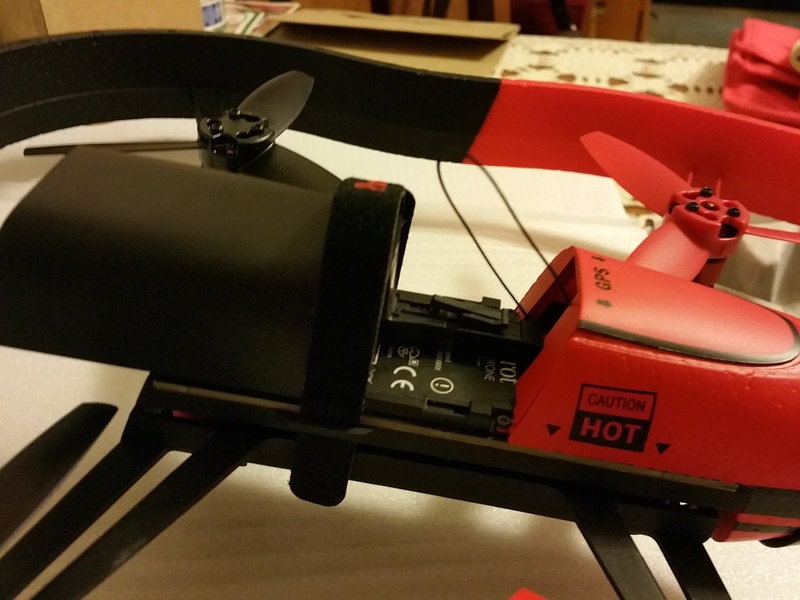 The propellers are powered by high quality brushless motors, far more powerful than most small UAS’s in this class. They do have “contact shut down” built in..still, you will get cut or hurt if you are the thing stopping them from turning. As in issue two above, setup should not require you to be connected to the BeBop………this should be corrected in a Free Flight 3 update as soon as possible. Bottom line for Part 1 – these are sold and appeal to the users with no technical sense (that’s the whole idea based upon the poor quick start guide). Despite appealing to the unwashed masses, the software and user-friendliness does not appear to be there (yet). It seems as if the Parrot doesn’t have the BeBop in a condition that it defaults to a “fail-safe beginner” setup. This would stop the person who buys it and just takes it out and starts flying from lose it. It should just shut off or refuse to fly – and/or give warnings that certain setup needs to be done. 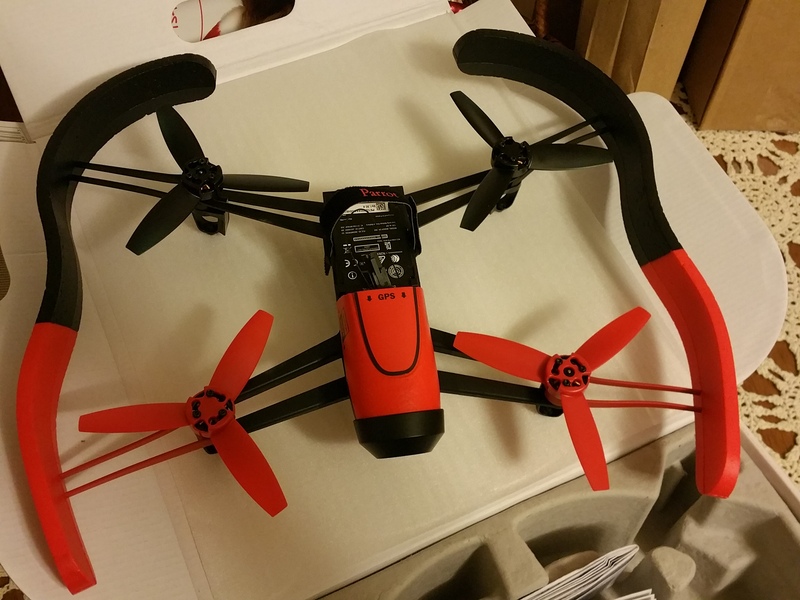 If your looking for your first UAV (drone/quadcopter) – we would not recommend it quite yet. While the BeBop is fun and has some neat features, the lack of user-friendliness and inability to “protect you from yourself” needs some improvement. Hopefully future updates to the app and firmware will correct these issues and allow us to recommend it for more novice pilots. DJI and Blade (Horizon) have offerings for around the same or lower cost that beginners can learn the basics with – however, the are not full featured with FPV, Stabilized Video, etc. – you’d have to spend about 2X the cost of the BeBop for those features. If and when the BeBop is upgraded to appeal to the class of person who doesn’t want to get too technical, it could be a winner. We hope they are listening to the public and to reviews….the BeBop has great potential which is not unlocked yet. It’s 3/4 of what a modern consumer drone SHOULD be, but without the other 1/4 it remains a toy for the very technical minded hobbyist. Discuss the BeBop and ask questions in our Forum Continuation Thread Here.